Worlds Adrift has been flying pretty low under the radar, and it's only recently that Bossa Studios has had the guts to come out and say what its game really is. Because it sounds like fantasy, and had I not seen it played I'd call fake on some of Bossa's footage. 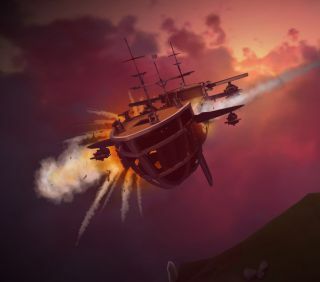 Worlds Adrift is a massively multiplayer, perpetually persistent simulation in which everything is beholden to the laws of physics, from ropes, which knot and flex, to cannonballs that do more damage the heavier they get. Just to make it extra clear: this has never been possible in an MMO before. The tech by Improbable that props it up is also being used in Dean Hall's Ion. Now, Bossa has released a short clip of its very first alpha test. "The most rewarding (and entertaining!) thing for us was watching players slowly figure out the controls, figure out the logic and rules of the world, and see their 'a-ha!' moments when it dawns on them that everything is real and persistent! "Not all was roses, though! Trees were rolling oddly like drunk clowns and a lot more people died than we would have liked to, so we have to correct those quickly. But other than that (and some nasty bugs aside), everyone had genuine fun building their skyships and having the very first battles in the game. There was a strong sense of camaraderie as well as crews formed quickly and spontaneously. "Now it's heads down, bug-fixing and feature-expansion in time for the next playtest, which is happening soon." You can apply to be part of that test if you like. I tried to sneak in, but I think they were worried I might, you know, say things about it.